KJ lost 50 lbs with hCG injections over 4 years ago. Yes, that’s right, she’s been maintaining her weight loss for 4 years. Ratio of of women who deal with cancer at some point in their lives – 1 in 3. It was at the age of 46 when KJ decided to do things right. According to her, it was kind of like her mid-life gift for herself. Prior to losing weight through hCG, KJ weighed 183 pounds, which she did not know until she was forced to go to the doctor because of a backache. She was asked to step on the scale (which she absolutely didn’t want to do) and when she saw how much she weighed, KJ was horrified and there and then she decided she had to do something about it. KJ admitted to having unhealthy eating habits all the way back to when she was still a model up until the time she was already working in the hotel industry. At her job, work-related angst drove KJ to eat more and eventually she realized she wasn’t punishing anyone but herself. Read on to know more about KJ’s weight loss experience and how she has successfully kept the weight off as well as what she does to keep herself healthy, fit, and happy! KJ did P2 for 60 days straight where she ate between 550 to 750 calories based on her hunger. Her hCG injection dosage was 200 iu. She lost 50 pounds in 60 days. According to KJ, as she went into phase 3, she was able to stabilize perfectly. She did it in 3 divisions; first, she figured out her max calories, then she worked up to it for 3 weeks by starting with a third of the amount, and then adding another third the following week until she reached her max calories, which at the end of P3, was 1,690. She would eat more when exercising. Another thing that KJ experienced was going from “flat to fab” because of her fat consumption. She noticed that her breasts and her booty came back and even her cheeks also became plumper. And all of that happened without a change in her weight or her size. Now, she sticks to a P3 lifestyle – no grains, no sugars – with an exception for occasional treats. 🙂 She lives by the 80/20 rule. That is, 80% clean and green where she sticks to pastured or grass-fed protein sources and low carb veggies while the other 20%, she parties up and completely lets loose – a good example – she had a dish of soft serve ice-cream just the other night. 😀 KJ bases the treats on her cravings and because she has such a clean diet now, she only gets cravings for something sweet or carby once in a while. According to KJ, she differentiates between cheats and treats because she acknowledges her cravings, she listens to her body that’s why she has no guilt when enjoying her treats. Even with alcohol consumption, she knew when to stop herself and when to schedule/plan her intake. KJ used P4 to find what her body was sensitive to when it comes to gaining weight. For the first week, she tried one sugary or starchy type of food for one meal. For the next, she went with either a sugary or starchy (but not combined) food for 2 meals. For week 3, she combined a starchy and sugary meal (i.e. jelly on whole wheat toast). She did this to see how her body reacted to the combinations because she was so nervous about gaining weight. At the end of P4, KJ decided that it’s so much easier for her to stay on a P3 diet (her 80/20) with the occasional treats 20% of the time. KJ’s breakfast consists of organic raw cream which she mixes with a big mug of coffee plus lots of water with slices of lemon or cucumber. The abundant fluid intake make her feel very full that she usually doesn’t get hungry until 4 or 5 in the afternoon. The time usually depends on whether she woke up late or early, but it typically takes several hours before she starts to feel hungry (e.g. if she wakes up at 6 am, she might get hungry around noon and if she gets up at 9 or 10 am, she usually wouldn’t get hungry until dinner). KJ believes that the (long) time it takes for her to get hungry has been reinforced by the hCG protocol. She also feels that she has better mental focus before she eats, rather than after. KJ does Bikram Yoga every morning, 5 days a week. She also does some weightlifting (her kids even ask to join her sometimes! :D) and once or twice a week, she trains her clients and goes on outdoorsy adventures with them like hiking. For KJ, it’s all about fun and intense exercises. Having fun in her workout regimen is very important to her. She believes that our bodies react to our choices and feelings that’s why it’s very important to enjoy what you’re doing. KJ says that it’s important to realize that once you get in tune with your body by eating extremely clean, you’ll have food freedom. Basically, you get rid of your obsession with food and become more productive. Last April, KJ was diagnosed with hypothyroidism. Before getting diagnosed, she had been wondering why even though she was eating clean, her midsection was getting larger. She also noticed that she was getting a lot of sleep but she would still wake up tired. As she went around doing her regular activities, she felt that something just wasn’t right. Because she is so in tune with her body, KJ knew that something was off. She specifically felt that something was wrong with her T4 (thyroid hormone, thyroxin). She went to a doctor and insisted to get tested. She proved herself right. 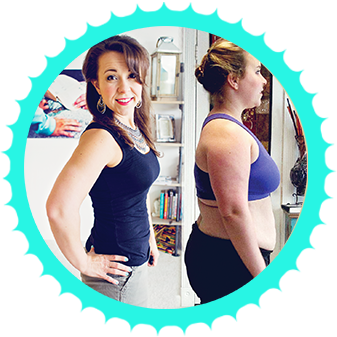 She started taking a natural thyroid hormone and her belly slimmed down and her symptoms improved after just 6 weeks of using it. Through her books, KJ wants to share all the knowledge that she has gained, not only from her personal experiences, but also from all her extensive researches. She writes about her personal weight loss journey, basic nutrition, her current diet, activities, how to gain support in making lifestyle changes for the better and even cancer healing food therapies. She also holds FREE self healing workshops which she does about once a month. She’s very passionate about helping people make life improvement choices. I encourage all of you to watch the interview so you can hear all about KJ’s amazing hCG experience and get more information on her awesome books and free workshops. So inspiring but frustrating at the same time. I can’t lose weight unless I eat one meal a day (3.5oz chicken breast and a tomato and two grassing sticks in the morning and at dinner. I’ve lost 15lbs in 4 weeks. I’m at 12iu and I don’t get hungry. I stared at 184 and at 169. I was planning on a 60 day round. Any suggestions? I would have loved to lose 50lbs in 60 days! Thank you so much for posting this. I am new to your blog and it has been a life saver! This is my second try on hcg. My first was 2 years ago but I didn’t know about the maintenance ‘diet’ afterwards so it totally didn’t work and I gained it all back and a little more. I’ve been trying to eat more paleo but have been feeling more like giving up these past 6 months. I’m 48 and figured”I’m a mom, I’m not supposed to be skinny any more. Why create more stress by worrying about every little thing I put in my mouth”. I live in Australia and it is a growing nation ‘weight wise’ but have just recently been back home to the States and was totally embarrassed by my additional 30lbs. Seeing my brother and sister-law looking so lean and able to wear clothes appropriate to the heat of Texas and knowing they go for a run every morning gave me a real impetus to change what I was doing. So here I am feeling like I had know idea what I was doing and found you to help me sort it all out. So a BIG ‘THANK YOU’ for all your hard work and effort to put all of this together. I have also just joined a gym which I will start attending once I’m into phase 3? I am currently in my 3rd week of P2 and am going to start looking at what I need to prepare for for P3. My weight loss has been slower than expected (4.5kg) but I have had a couple hiccups along the way, not due to cheating but having to eat after 7pm a couple times and getting called into work with no food prepared so I just grabbed the ramen noodles. But is has not deterred me! I am feeling so much better in my clothes and I actually feel lighter and I am determined to make it work this time. Thank you so much! I love KJ, she’s such an inspiration! Wonderful Interview! Thanks for all the great tips & insights. I have a few questions. I was diagnosed with hashimoto’s when I was 33. I went from 117 lbs (size 4) to 209 lbs (size 14) in 3 years before I was properly diagnosed. I have been on different meds since then at all sorts of different dosages from 225mcg to 112mcg. I was never able to lose all the weight that I gained during the time I went undiagnosed. I am now 48 years old and have spent the last 18 years overweight and sick. Earlier this year I switched from Synthroid to a natural desiccated thyroid med along with natural compounded progesterone and blood work comes back normal. My functional medicine doctor suggested HCG, so I did it. I am 5’3″ and I started round 1 at 171. At the end of round 1 I had lost 16 pounds (I was eating 400-700 calories per day). I did a second round of HCG and stuck to 500 calories per day. I didn’t use balsamic vinegar like I did in the first round. I was stricter in the 2nd round than I was on the 1st, but I only lost 9 pounds!! I was very disappointed. I am now 146 pounds and I want to get down to between 120-125. I am afraid when I do round 3 that I will only lose 5 pounds and that I will never get down to my goal weight. Any suggestions? Oh…and my doctor gave me the rapid dissolve sub-lingual tablets that she orders from a compounding pharmacy. Are the compounded tablets less effective? Should I do the shots for the third round? Anyone have any ideas? All I see are these amazing success stories of people with hypothyroidism who lost lots of weight on HCG. I had hoped I would also be one of them. I mean, I have lost weight, but I had hoped that I would be at my goal weight in 2 or 3 rounds. At this rate, I may end up having to do 6 rounds and I may not ever get there! As you can tell, I am a bit discouraged. On a good note though, the maintenance phase is absolutely no problem for me. Both times I maintained within one pound of my ending weight. I never even had to do a steak day either time, so that’s good. I eat paleo when I am not on HCG. No caffeine, no sugar or artificial sweeteners, no grains or gluten, no dairy, no alcohol of any kind, no processed food. I do allow for honey and maple syrup for sweeteners on phase 4 Any suggestions or advice for when I start round 3 of the HCG is greatly appreciated. Thanks! It does sound like you’re having some hormonal imbalance issues going on. And also, I’m not 100% sure, but getting pharmaceutical hCG injection can maybe help. I don’t have enough information but what I do know is that sometimes thyroid problems really does cause weight stalls or slower weight loss.